This house, constructed in the late 18th century, was home to the Grimes family, a Quaker family active in the New Jersey antislavery movement. Dr. John Grimes (1802-1875), the most noted and vociferous antislavery advocate in the family, was born in this house and lived here until 1828 when he moved to nearby Passaic County to practice medicine. 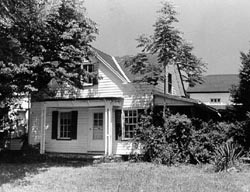 In 1832, he moved back to the homestead in Morris County and subsequently relocated to the neighboring community of Boonton. New Jersey's citizens were divided over the issue of slavery. Many people in New Jersey were sympathetic to the southern slave owners who had economic as well as social ties to the state. This faction was challenged by another group, largely comprised of Quakers like the Grimes family, who publicly opposed slavery. Once arrested for harboring a runaway slave, Dr. Grimes was repeatedly harassed by supporters of slavery while living at this house and later at his home in Boonton. Dr. Grimes' participation in the Underground Railroad is substantiated in his 1875 obituary in the newspaper Jerseyman, that stated, "In the earlier days, his father's house, Mr. Jonathan Grimes of Parsippany (Mt. Lakes today), was a prominent station on the celebrated Underground Railroad. In later days it was transferred to his own home in Boonton through which many a poor runaway has been helped on his way to Canada. They came to him from Baxter Sayre, Esq. of Madison (long since dead) he forwarding them in the night to Newfoundland, the next station." 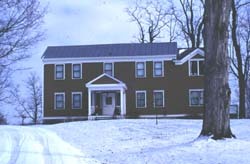 The Grimes Homestead is located in Mountain Lakes, New Jersey. A private residence, it is not open to the public.